Chhath Puja has been celebrated with much grandeur and zeal on Friday all over the country. Hundreds of people were sighted offering prayers in Delhi's ITO and Mumbai's Juhu beach. Chhath Puja is performed to thank Lord Surya and Chhati Maiyya (Usha, Lord Surya's wife), for sustaining life on earth and request them to grant certain wishes. This year Chhath Puja has started on October 24 and ended with Suryodaya Argh on Thursday, October 27. The fourth and the final day, also known as 'Suryodaya Argh' is the day to offer early morning prayers to the God of life and energy followed by 'Parana' where devotees break their fast after 36 long hours. 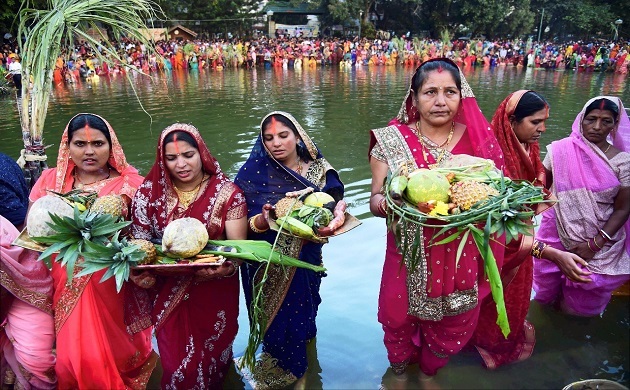 Though Chhath is generally celebrated in Bihar, Uttar Pradesh, Jharkhand and some parts of Nepal, with many people from those states moving to Delhi and Maharashtra, it has become an important festival all over the country. Bihar Chief Minister Nitish Kumar and RJD Chief Lalu Prasad Yadav have also seen celebrating this auspicious occasion at their residence. Here we bring you some of those special moments during celebrations. Bihar Chief Minister Nitish Kumar has been seen celebrating 'Kharna' ritual at his official residence on Thursday. Nitish Kumar is expected to visit the Nasriganj Ghat at Danapur. Deputy Chief Minister Sushil Kumar Modi has distributed 'kalsoops', coconuts, incense sticks and other items to devotees. Special arrangements and necessary steps were taken to ensure safety and security at the ghats in Bihar, said Sushil Kumar Modi. Rashtriya Janata Dal (RJD) chief Lalu Prasad Yadav and former Chief Minister Rabri Devi celebrated the Chhath Puja at their home in Patna on Friday. Tejashwi Yadav took to microblogging site Twitter and shared a picture of his mother Rabri Devi and other family members. In the picture the entire family along with Rabri Devi has been seen cooking by the fire, in the middle of Chhath Puja preparations.